Honey posses curly chocolate brown locks and light brown eyes. Standing at 4 ft. and 7 inches, she has still a lot of growing before reaching her adult height. Her physic is lean but not overly bony. Her complexion is fair and her dominant hand is her left. While she has yet to develop a sense of style, she does prefer dresses that allow her to move freely. ※ She has two pets. A Holland lop named Nibbles and a Snowy Owl named Chouette. Chouette was bought in 1886 after she found out that rabbits are not allowed in Hogwarts. 1874| Honey is born and crushes Handsome's hopes of a male sibling. 1877| The family moves to Hogsmeade because muggles had discovered the existence of wizards and witches. Hun Bun has little to no memory of the move. 1882| Pumpkin joins the twins and is sorted in Slytherin. 1883| Sweetie goes to Hogwarts and was sorted in Slytherin. She also receives her first pet on her birthday a male rabbit which she named Nibbles. 1884| The laughing plague kills her father. She was often spoiled by their papa due to her position as the youngest and it left her in tears for a good amount of time. Their home was also burned which makes it even worse. They move to Irvingly after the chaos was over. Darling is sent to Hogwarts later and was sorted in Hufflepuff. 1886| After the mourning period for her mother is over she begins a career on healing. While she felt abandoned by her mother's choice she can't help but let her do what she wanted. It was nice to see her Mama doing what she liked other than just mopping at home with her. In autumn, Honey joins their siblings at Hogwarts (with a new pet owl).The start of the school year made a surprising turn as Peeves had stolen the Sorting hat! Hun was 'sorted' temporarily at Slytherin with Sweetie who was very pleased about it. Honey however felt so out of placed in the den of snakes and she was sure that she wouldn't be placed there! 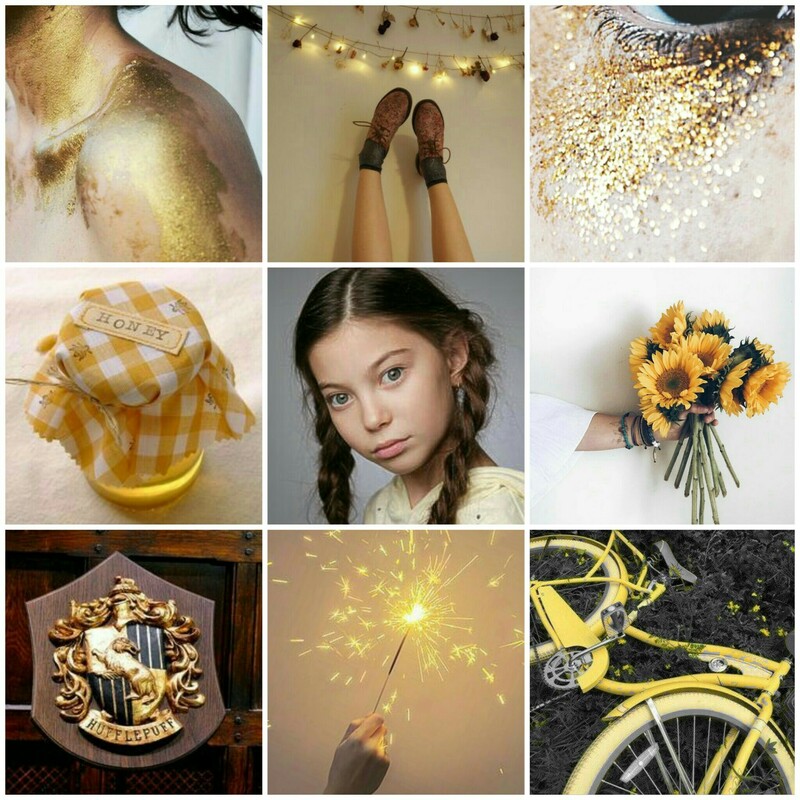 She was right, she was placed in Hufflepuff along with Darling. Sweetie felt that Honey betrays her and the two end up fighting and avoiding each others presence (and some insults thrown on her part). Honey wanted to make up with her sister but she knew that if she made the first move, she would be spoiling her sister. 1887| Sweetie argues with Miss Madeline Backus, her house prefect and Handsome's friend. Handsome hears about it and the two end up arguing. Honestly, Honey doesn't care for Sweetie and silently sides with her brother. In July, their mother winds up dead after the catastrophe at the World Wizarding Fair. Once more, she ends up in tears for a while. As odd as Heartwarming was she was still their mother. Handsome and Sweetie still hadn't made up - and probably never will - but they do after Honey awkwardly approaches Sweetie. Maybe she should have done this sooner but she feared on how Sweetie would react. ※They have odd names. Everyone in the family is not exactly normal either. ※They were orphaned in 1887 when their mother died. They currently reside with their paternal Grandmother. ※Her brother, Handsome, was a former head boy in 1888. He currently plays as a reserve for Hogsmeade Howler. Plot Preferences: ※Honey is currently open for new plots and new threads. ※I mostly tend to go with the flow since my characters have their own mind and even surprises me sometimes with their actions but won't mind if we plot details out. ※I'm comfortable with writing mature content (violence,gore, dark content) is also alright with me though I prefer if we fade to black with any sexual encounter. ※My post length average is 150-200 words though I will try to match up with my partner if I can. I also depends on how much muse I have. I'm also a full time student so I can be slow in posting. Well, I feel like he hasn’t been himself since mother’s death which has only gotten worse after grandmother’s demise. But if that is how you feel then I won’t press on the issue any further. Perhaps in the near future there would be a time when you two would at least not be tempted to point a steak knife at one another when in the same room. Keep safe.